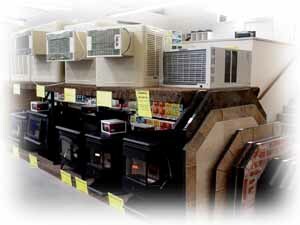 BIG R is your seasonal supply store for all of your heating and cooling needs! Our stores carry a large selection of pellet stoves and wood stoves by Harmon and Drolet. We also have kerosene, propane and electric heaters. To fuel your stove we stock over 20 tons of premium wood pellets. BIG R also has the best selection of log splitters available in 22, 28 and 34 ton splitting capacity. When the weather gets warm go to BIG R to cool down with a new swamp cooler or air conditioner! With a full line of side draft and down draft evaporative coolers, as well as a large selection of air conditioners BIG R will have what you need. And don t forget that we stock a large selection of cooler parts and pads to keep your existing unit in top shape. Warm or cold, BIG R is the place to go!